Evelina Zuni Lucero is Isleta/San Juan Pueblo. She spent the first eight years of her life at Isleta Pueblo. Later when her family moved, she attended public schools in Ignacio, Colorado, and Carson City, Nevada, where she graduated from high school. She attended Stanford University at the onset of its Native American program where she majored in journalism and graduated with a bachelor's degree in Communications. For a number of years she worked in the journalism field with Native organizations as a news reporter, and communications specialist. She received her master's degree in English from the University of New Mexico in the creative writing program. She currently is on the creative writing faculty at the Institute of American Indian Arts in Santa Fe, where she teaches courses in fiction writing, creative nonfiction, Native American literature, Native fiction, and Native American journalism. Lucero says, "My concerns for Indian people are reflected in my novel, Night Sky, Morning Star . I wanted to deal with issue of historical trauma Indian people have suffered for over 500 years now, and the unresolved pasts that go hand in hand with the trauma. The characters illustrate the unresolved pasts shoved into the closet and not dealt with. When I gave it thought, a Native prisoner was a fitting characterization of the Indian experience in the Americas." Her concern has extended to community service by acting as an advisor for the documentary film, Domestic Violence; It's Not A Tradition, on domestic violence in Pueblo communities in 1995. 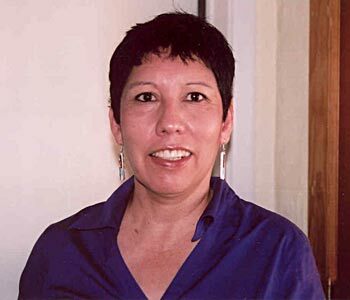 She has also acted as the coordinator of a reading series for Isleta Pueblo Headstart and Isleta community in 1992. She organized a series of readings and performances by Pueblo poets/storytellers which culminated in a joint cultural event of storytelling, poetry and music. Excerpts from the novel were published in various journals and anthologies, including Blue Mesa Review , Northeast Indian Quarterly , Returning the Gift Anthology , Women On Hunting , Native American Literature and Native Roots & Rhythms . Lucero recently received an Ataaxum Fellowship for Native artists awarded by the Dorland Mountain Artists Colony, which provides a writing residency. She is working on a second novel involving Indian gaming. She lives at Isleta Pueblo with her husband and children. Evelina's book, Night Sky, Morning Star , her first novel, received the 1999 First Book Award for Fiction from the Native Writers' Circle of the Americas. This book was selected as the October Book of the Month by "Native America Calling," in 2000. Night Sky, Morning Star , University of Arizona Press. Stories for a Winter's Night , Maurice Kenney (Editor), White Pine Pr. Women on Hunting, Pam Houston (Editor), Harpercollins. Native-American Literature: A Brief Introduction and Anthology , Gerald Vizenor (Editor), Longman Pub. (Sun Tracks, Vol 29), Joseph Bruchac (Editor), Univ. Arizona Pr. "Soul of Albuquerque," Alibi 9-15, Nov. 2000: 32-33. "Commentaries: When Jesus Came, the Corn Mothers Went Away...," American Indian Culture and Research Journal , 17.3 (1993). "Sacred Wraps," Native Roots and Rhythm, 1.1 (1999): 7. "Seasons," Northeast Indian Quarterly, Fall 1991: 31-42. Here First , "On the Tip of My Tongue,"
October Book of the Month, "Native America Calling,"
This is an "official" site in that this page was constructed with the assistance and active collaboration of the poet, Evelina Zuni Lucero. The website "author" is Karen M. Strom. © 2004 Evelina Zuni Lucero and Karen Strom.